… give a warm welcome to the first application board using ZED-F9P! So far we have tested the same PCB with a regular NEO-M8P GNSS module. 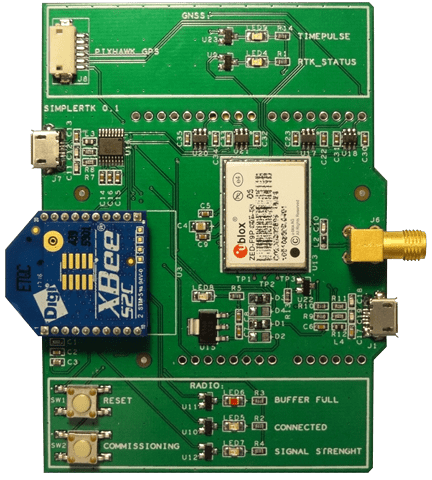 This has been great for generic tests but when it comes to performance, it didn’t make sense to invest a lot of time since the core of our simpleRTK2B application board was still not there. Well, now we can. We couldn’t wait to start the planned test campaign and we jumped to the field to see if the hype was worth it. In the next post we will show these preliminary results. As we said in the previous post, we removed the flying wires and now our prototype looks much better, but it’s still a prototype. During the tests we had to look continuously to the schematics to find the function of the header pins. We don’t want you to do the same so we will print labels on all the used pins in the PCB. Another struggle we had to deal with was to remember which board was the base and which one was the rover. We handled that one easily by sticking some paper on each board. On the first prototype we placed many LEDs and buttons to get as much information as possible. At the end we only looked at a few of them and the rest were only confusing us. The next design will reduce the number.